Here are two thoughtful pieces regarding the atrocious fire in a tower block in London on the 15th. We can’t help but feel that London’s economic regime, aided and abetted by public policy, produced this fire. People in authority need to go to jail. Already there are several clear lines of responsibility leading to both government and business which indicate the fire would have been prevented had some fairly moderate things been tended to. Unfortunately, the neoliberal economic regime in the UK is a beast now quite skilled at defending itself from acquiring responsibility for disasters of every kind from questionable privatization drives to botched wars. UK public money is available for wars in the Middle East, for surveillance programs run by intelligence agencies, and extensive agricultural subsidies. The local government body responsible for the building recently handed out a property tax rebate and is one of the wealthiest in Britain with large amounts of money on hand. Real property in London represents a vast and profitable churn of billions of pounds yearly and social housing has been a component of that for many years. Why so little for the Grenfell’s residents? We’ll see over the next few years if eighty or more lives are enough to change things. UK think tank Centre for London tracks the rich moving in and the poor moving out in a new report. Eligibility statistics for a UK children’s meal program appear to indicate the way lower income people are being rushed out of the UK capital. This blog may have to order the construction of a new library annex to house all the reports on suburban poverty it come across. UK-based Smith Institute has just added to our holdings with the release of its findings after looking at suburban poverty in Wales and England. Nearly seven million people are in poverty in suburban areas in the two countries. The majority of the poor in Wales and England are now actually found in suburbs. According to the report suburban poverty went up by thirty-four percent between 2001 and 2011. The high cost of housing is expected to aggravate things in the future although the report identifies several possibilities for mitigating suburban poverty. On that list is a careful application of increased density in support of higher frequency public transit to increase connections between suburban residents and the public realm. If suburban-poverty.com could get a long distance romantic crush going on another blog it’d probably be for Renter Girl at Blogger. Perils and precarity mark out the renting life in a global financial uber-capital and it takes a brave bloggess to survive it all. In big, bad London it doesn’t matter how far out you move you don’t get a break. Fresh stresses await the working people of London, too, as prices soar, global investors flock in, wages lag, and governments ignore or aggravate the whole mess by turns. Renter Girl’s author is one Penny Anderson who also writes about housing issues, renting, working and getting by for the Guardian. Keep up the good blogging Renter Girl. …mainly New York City but we saw Ottawa, Toronto and dozens of other places represented in this hall of landlord shame. A feature series started today on theguardian.com about northeastern London’s Enfield. The sorry state of Enfield makes for an excellent read when it comes to understanding how bad a place can get. Enfield was once an industrial dynamo and seems on the edge of catastrophe now with the one-percenter’s London of bailed-out banks and high consumerism nowhere in sight. Crime, poverty and unemployment have wrecked the reputation of the area and driven off investment. Shades of Detroit, Michigan and Camden New Jersey, America’s moribund urban industrial centres emerge as Aditya Chakrabortty describes how his home turf fell down the basement stairs. Additionally, nearly every part of suburban poverty as known on this continent is found in Enfield, especially the frustrations of poor transit connections to the wider economy and the way that holds back recovery. The neglect and failure of this once mainstream part of London is almost complete for many of its people and now the future has truly arrived. It seems something radical, something experiemental is about the only thing left for Enfield, hence the name of the series. The Enfield Experiment: London’s fortunes distilled into a single borough. Recent efforts to reform welfare benefit schemes in the United Kingdom are under way and as expected are no small source of contention. An important possible measure of the success or failure of this austerity-driven reform might sensibly be found in food bank use. Scotland and England have both seen recent high level reports into such things. Yesterday a blogger at the Guardian online shared a positive impression of the seriousness and value of the Scottish report and contrasted its publication with the suppression of a similar document produced in England. We’ve heard it said that to get to know a place you should take a long walk there. And so we join UK writer, commentator and psychogeographer Will Self on foot, out and about, away from the centre of Paris. Or you could also sit still with a place through the full cycle of day and night. Like this writer did for The Economist recently at a service centre off the M1 motorway. The Next City got the new year started off on bit of a lame, frowny-downy note. 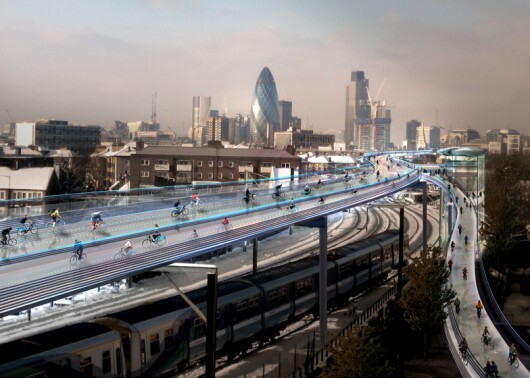 They provided a brief, negatory reaction to UK starchitect Norman Foster’s support for an elevated bicycle expressway in London, England. The structures would reach about 220km in length eventually and would utilize space directly above rail lines. Foster may be an elite practitioner but it’s doubtful he’d associate himself with something like this before giving some consideration to costs, benefits and practical matters of useability. He’s a cyclist and trail advocate. The reaction at the first link below feels superficial, like the pre-1900 pooh-poohing of aeroplanes in which the person doing the pooh-poohing would tell listeners that if man were meant to fly he’d have been born with wings. Just think of the interesting views of Londinium from up there on the SkyCycle. After coming across a non-profit grocery store in the northeastern United States for the previous post we find a social supermarket in the United Kingdom. And it’s probably going to be joined by others before long according to data from the New Economic Foundation which finds some 5 million people in the UK are low income.